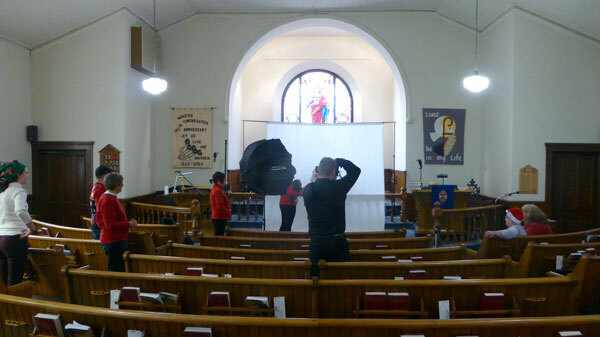 It was quite the time on Saturday, 28 November in Munster United Church. 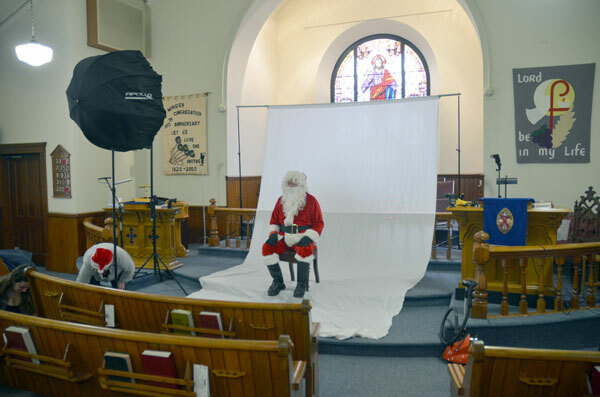 Santa was in the church. 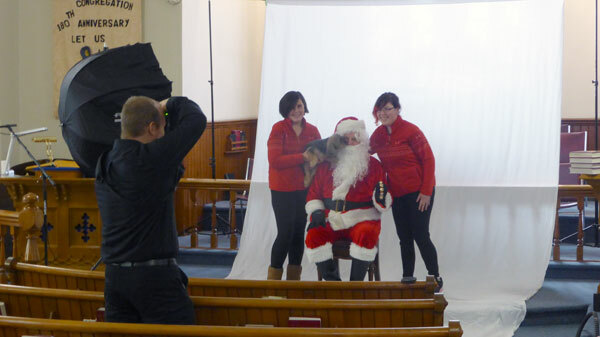 Families brought pets in for photos with Santa and all were well behaved, Santa included. Santa wasn’t scared by the pets and the pets weren’t scared of Santa. Ryan Lindsey had set up his photography equipment and was ready to start photographing for the first booking Saturday morning. There were dogs and cats in the photos but no goldfish, hamsters, elephants, or unicorns. Overall the day went very well. All but two time slots were booked, which meant Ryan and Santa were able to have a few breaks along with the support team. For those who had photos taken, the prints should be available now. We are connecting with Ryan to pick them up from him Monday and be in touch with you to arrange to transfer them to you. Also, Ryan has set up a web page for your photos to view – your choices and his choices – in case you would like to see them again and in case you might need to order a few extra prints. The information will accompany your prints. 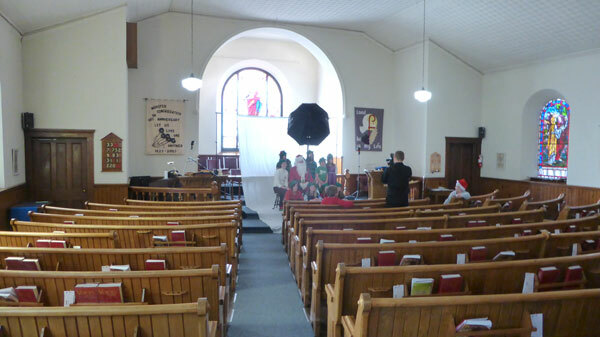 At the same time as families and pets were passing through the basement, the Youth Group had a table of baked goods for sale that they had baked earlier. They were raising funds to support their latest project – SmileTrain which helps others born with a cleft. They thank you for your purchases and support. 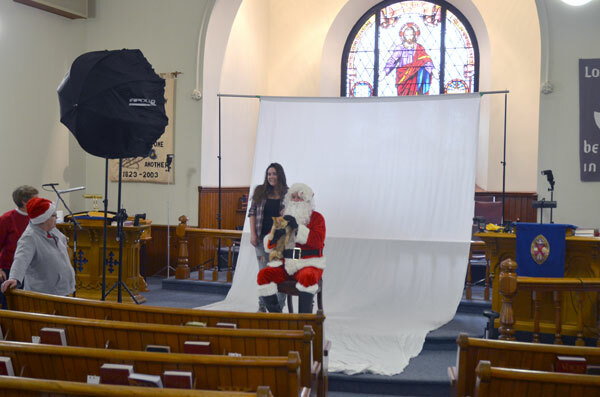 Below are a few ‘behind the scene’ photos of the set up where pets and Santa had their photos taken. Final adjustments with Santa in his chair. A relaxed cat enjoying the moment with Santa. Santa, the pet, family members, and helpers. A loving pet really likes Santa to the delight of family members. The big picture of how it was being staged.